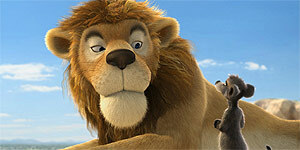 Directed by Reinhard Kloos and Holger Tappe, Animals United is a European animated film (in 3D) that's been dubbed for the British market. The film opens in the Kalahari Desert, with cheeky meerkat Billy (James Corden) promising his wife Bonnie (Billie Piper) that he'll find water after the annual floodwaters fail to arrive in the Okavango Delta. With his best friend Socrates the vegetarian lion (Stephen Fry) in tow, Billy sets out to discover what's happened to their vital water supply. Along the way, they get help from an unlikely group of animals that have somehow ended up in the Kalahari Desert, including: Sushi the polar bear (Bella Hudson), Toby the kangaroo (Jason Donovan), Smiley the Tasmanian Devil (Pete Zarustica), 715-year-old giant tortoises Winston (Jim Broadbent) and Winnifred (Vanessa Redgrave) and cocky French cockerel Charles (Andy Serkis). To be fair, the animation is of a much higher standard than is usual for these sorts of films (see, or rather don't, The Ugly Duckling, etc.) and the character designs are less crude than their equivalents in, say, Madagascar (one of several heavily ripped-off sources – Warner Brothers should definitely sue for Tasmanian Devil infringement). Similarly, some obvious effort has gone into the 3D effects and they are occasionally impressive. James Corden gives a dreadful central performance as Billy, delivering all his lines in a high-pitched whiny voice that he often fails to sustain and gives up on, mid-sentence. As if that wasn't bad enough, the film completely wastes the rest of its high-profile cast, giving them little or nothing to do: Donovan gets particularly short shrift as Toby, while only Serkis manages to really distinguish himself, and Charles is the only character that gets anything approaching a decent laugh. The film's biggest problem, however, is the script, which is frequently dull, desperately unfunny and often woefully misguided (such as in a subplot involving the death of Socrates' brother). It also presents a confusing eco-message with the animals blowing up the dam on one hand (like, um, terrorists) and organising a delegation to the UN on the other. Animals United is a derivative, frequently boring and painfully unfunny animated comedy that's badly written and renders its big-name cast utterly pointless. One to avoid.